How you store your fruits, vegetable, and herbs can affect their texture, ripeness, and even flavor! This summer, follow these simple storage guidelines to optimize the taste and shelf-life of your produce. Ripe Avocados: To speed up the ripening of your avocados, place them in a brown paper bag with an apple or banana. Fresh Greens: To keep your leafy greens fresh and crisp, wash them, dry them well, and place them in an airtight container lined with paper towels. The paper towel will absorb excess moisture from the greens, and the closed container will keep air in, slowing down the wilting process. Juicy, Vibrant Berries and Grapes: Wait to wash your berries and grapes until right before you eat them. These fruits have a dusty covering on their skin called “bloom,” which acts as a natural preservative against mold, and helps keep them fresh for longer. Crisp Asparagus and Herbs: Treat your asparagus and fresh herbs (except basil) like a flower bouquet: trim ½ an inch off of their ends, and stand them upright in a glass or jar filled with 1-2 inches of water. Store your asparagus in the refrigerator for up to a week, and leave herbs at room temperature. For extra crispness, loosely cover the top with a plastic bag or damp paper towel. 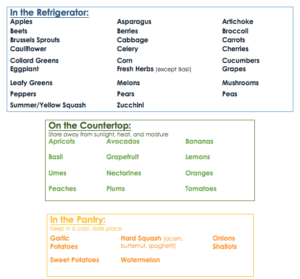 Prepped Produce: Always refrigerate cut or peeled produce, even if it isn’t refrigerated in its original state. Prepping your fruits and vegetables is also a great way to keep healthy snacks readily available. 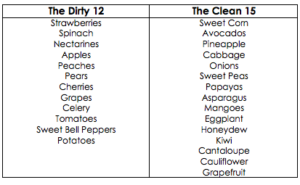 Take a look at this great reference from the Environmental Working Group to know which foods are the most pesticide-contaminated, and which are the least.